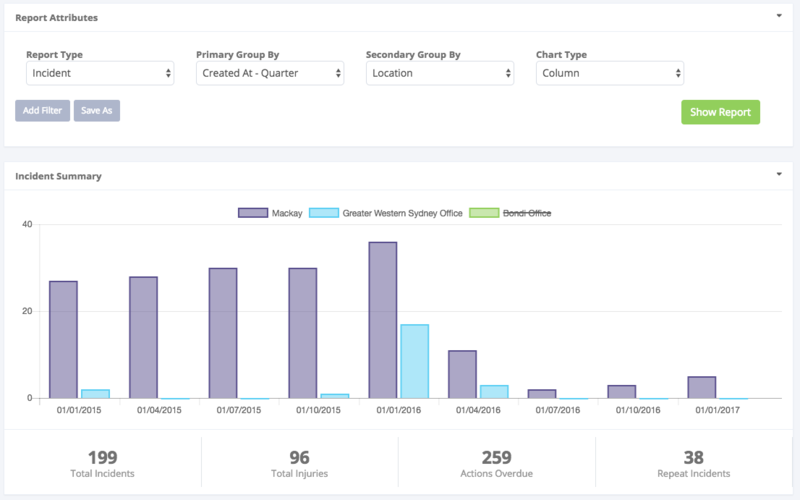 The New KPI Module in Donesafe allows team leaders to set KPIs and keep track of those KPIs for Audits, Observations and Consultations. 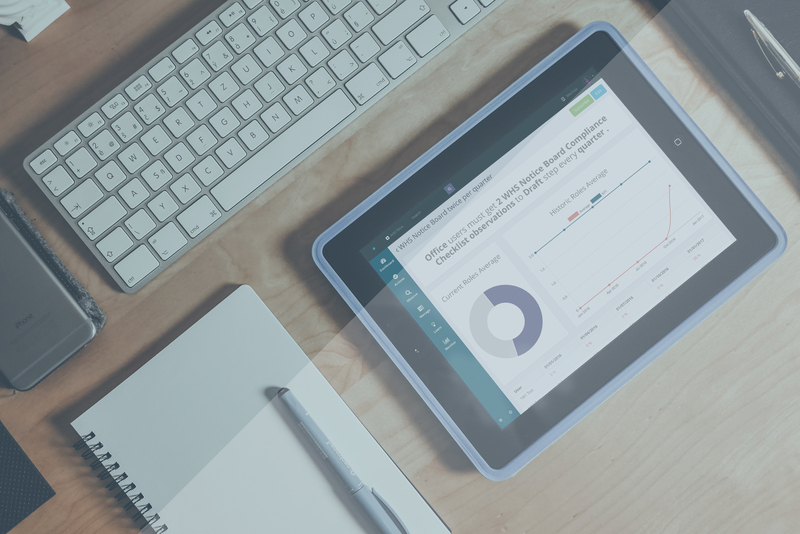 A KPI report would then be created that reports on your team based upon those parameters. This report only needs to be created once and will update as you move through each time frame; in this case; a quarter. 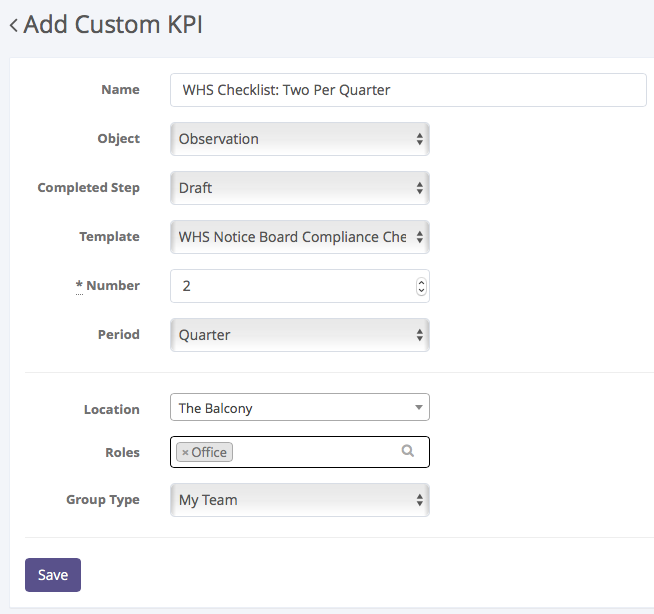 The report produced updates as users complete their reports and shows the KPI as compared to the real completion rate. 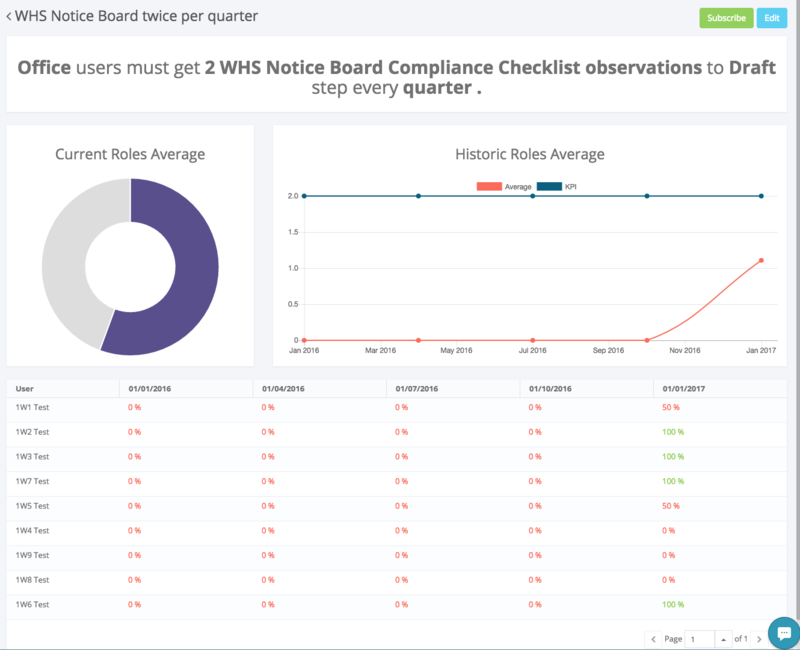 It also allows team managers to keep track of who has and hasn’t completed their required tasks; once again: completion of certain Audits, Observations or Consultations. This module’s functionality in Donesafe will expand over time (in fact, some more upgrades are coming this Friday 3rd of March ‘17). Already though, it allows a great deal more oversight from team leaders for their subordinate’s activities in Donesafe in regards to repeating audit templates. This is particularly useful when dealing with larger teams. KPIs are created to view data from the creator’s organisational hierarchy. So if a team leader creates a KPI, it will apply to their direct team, whereas if a company CEO creates one they could potentially view data from their entire company depending on the setup. It is important to understand that for a team leader to only see their subordinate’s records, they themselves must create the KPI to do this; it cannot be done by somebody else. There are plans to allow site admins to be able to create these on behalf of specific people or automatically in future, however, that is some time off. The reason that this approach was taken is that in larger businesses, individual managers have individual requirements and KPIs for their teams. It was because of the granularity needed that a granular delivery method was developed; at least in the short term. The KPI module is hidden by default, both at the module and role level. Go to Settings > Roles. Selecting the Role you’d like to edit it for, go down to KPIs and using the Role tools, enable it for that Role. From a usability standpoint, this new user interface update is perhaps the most significant improvement from an everyday user standpoint. This new update allows admins to include instructions above the workflow button. It also changes the workflow button into a back and forward style interface; shifting the stage names into a drop box that appears below and displaying the current workflow stage as a title. Finally, it shifts the follow button to the top of the record and adds the location data below. Users weren’t able to tell which were advancement steps or rejection steps. It wasn’t clear how the workflow button worked. Users without training were often unsure of what to do when creating or after being assigned a record. It wasn’t clear when a workflow had met its end. This new update resolves these issues and a handful of others in a simple, clean way and we’re all really excited about it. This one has been a common request for a while. Previously, actions defaulted to show all actions that were due within the next 7 days; including actions that had already been closed. Many users found this difficult to work with as it often made it unclear what actions needed to still be completed. Furthermore if an action was missed, it would disappear from the default view often resulting in actions being unfinished. Now the default action view will show by default: All OPEN or OVERDUE actions due from the beginning of time to seven days time. This makes it considerably easier to go through and quickly close out your actions without any uncertainty around whether they’ve been completed or not. To facilitate this an additional filter was added so that users could filter the state at the parent level. Added Rules on who has rights to, and where new Contact type users can be added. Adding new contact users is done by clicking on the add new user button next to people selectors as shown below. If this is set to ‘No’, then users of that role type cannot create contact type users at any time. From Settings > Modules you can now go in and turn off the ability to add contacts for all users for that module. This will override the Role permission to ensure that under no circumstances, no users can add a contact user on this module. New In depth materials on Permissions now Available. Donesafe’s permissions system is extremely configurable and powerful; which is great, but it does make it one of the trickiest parts of the platform to configure for more advanced, enterprise level systems with thousands of users. To account for this, documentation has been put together to explain the relationships between Role Permissions, Organisational Hierarchy, Locations and Workflow Restrictions. If you’re interested it’s a great read! The report builder was already awesome. Now it’s a bit more awesome. You can now chose a secondary grouping. For example, you might like to see incidents, grouped by quarter AND locations. You can now do this with ease (see below). You can see here we now have incidents by quarter grouped by location. Ta-da! Furthermore, you can filter out grouping results (on the chart only) by simply clicking on the grouping you’d like to remove. You will see in the above screenshot that I have crossed out ‘Bondi Office’. This location is then removed from the report chart. In the past, global search only searched a handful of modules. Gone are those days. Now global search returns records results on any record in the system the active user has rights to see. The only things it won’t search directly are Actions (which are indirectly through their relationship to other modules) and the body text of Knowledge Base articles. Apart from that, everything else in the platform is now searchable. Global search returns ONLY records users are allowed to see. This was the case before, but I thought it pertinent to say after mentioning that it searches all records. Thanks to the work done last month on caching permission rights, global search is now lightning fast by comparison to its predecessor. That’s not to say it’s instant for all searches; but it can search thousands of records and return useable results in under a second. Now that’s impressive. If you can’t find that record that you’re looking for you can now filter the results by module type, location and a to and from date. Nice and handy. Related to was also upgraded to use the same search code that Global Search uses. This means that relating records is now also; super fast. It also removes any risk of users seeing record names that they shouldn’t be able to. Furthermore, search results will also show up with the module name to which that record relates. This makes it significantly easier to identify the record you wish to relate. Finally, we updated the ID numbers for all records to be be shown as unique between modules. This may seem like a minor change, but it makes it significantly easier for the user to now search for a specific record. Where before an Incident’s ID might have been 0354, it now displays as INC0354. This ID can by typed into the global search bar at the top of the page to return a search result for that specific record making it significantly easier, particularly for administrative staff, to find and reference records easily. It’s now possible to include a call to action button with your actions that allows you to direct a user to a custom URL. Currently this functionality can only be triggered via an action track, however it provides an extra layer of functionality that many users were asking for. Now sorts alphabetically by vendor name by default. Default view now “My Chemical Registers” “Any Time”. Showing “All” “Any Time” was a common request by many users. Unfortunately, as “All” is not a view mode that all users have access to, we were unable to make this adjustment. This is the next best thing. Default view now “My Plant and Equipment” “Any Time”. New High Risk Score Trigger on Hazards. As part of action tracks, you can now set a max risk score in hazards to trigger an action track. So for example, you could say that if a risk score of 4 or greater is recorded against a hazard a manager will be notified. This takes the average of the Native and With Controls scores and compares them to the trigger. Be aware that this rounds to the nearest whole number. Added new Priority Order system to Controls. This priority order can be switched on or off from the Settings > Modules > Hazards > Edit . 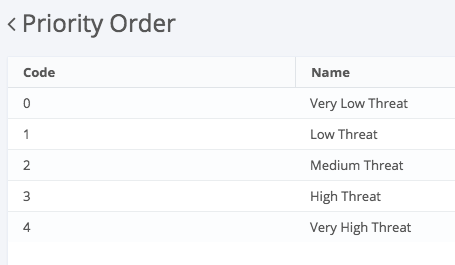 The Priority order options can be edited At Settings > Priority Order under the hazards heading. Here you can choose the number of options and their names. Now only displays records you have rights to. Now allows you to view by ‘My Objects’ ‘My Team’s Objects’ and ‘My Organisations Objects’. Added ability to create custom Person Involved roles. 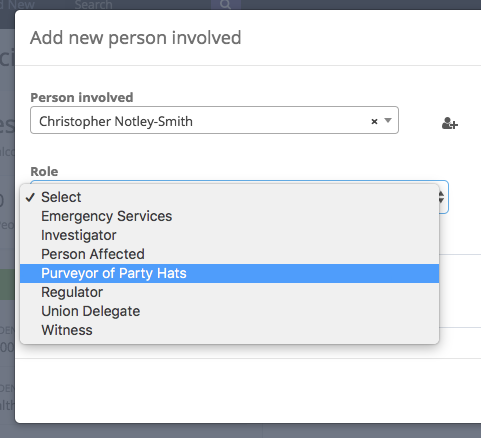 To administer these new roles go to Settings > Incident Participant Roles (under Incident). Here you can add and edit additional participant roles as well as choose whether or not to trigger the expanded Persons Involved form with those options. Now when you go to ‘Persons Involved’ in an incident record you’ll be able to select your new involvement type. Added ability for administrators to determine the expense types, values per expense and overall values per expense type applicable to a worker’s compensation record by scheme. Locked the “No Rights User” Role so that it cannot be deleted or renamed. Some users were renaming it which was causing errors. Improved access caching; some team leaders were unable to see their subordinate’s records. Resend Welcome Email no longer causing 404 errors. 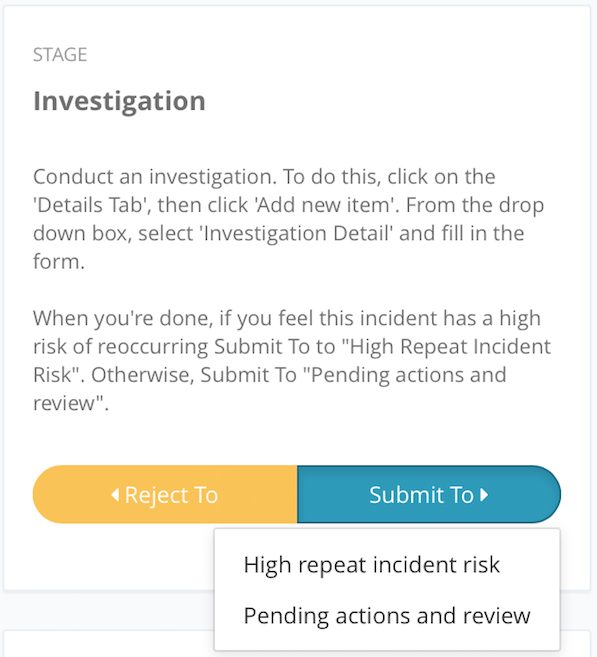 Users can now add files or actions to Investigation Templates again. The Workers Compensation forms no longer lock intermittently. The Workflow builder no longer resetting state number when edited. Users were reporting that they were unable to delete some records. This has been resolved. Users unable to save learning records: resolved. Hazard column reference changed from Created date to selected date on main form. Hazard controls are once again triggering actions as intended. Want to keep up with the latest updates as they happen? Sign up here.